Easy & Fun Downtown Location, near NewBo, US Call Center, and super Affordable. Spacious one bedroom apartment located in downtown Cedar Rapids. Within walking distance of U.S. Cellular Center, Paramount Theater, and all downtown Cedar Rapids attractions! Fully furnished for you, the traveler. Perfect for you stay whether business or pleasure. Being located in the heart of downtown Cedar Rapids; this apartment is perfect to experience "The Fifth Season" of Cedar Rapids. Minutes from restaurants, bars, theaters, event centers, banks, coffee shops, and more. The condo is located directly above the ground transportation center, Cedar Rapids' main hub, you can catch a bus to anywhere you'd need to be! If you don't want to step outside or are here on business, there's a sky-walk you can take as well! 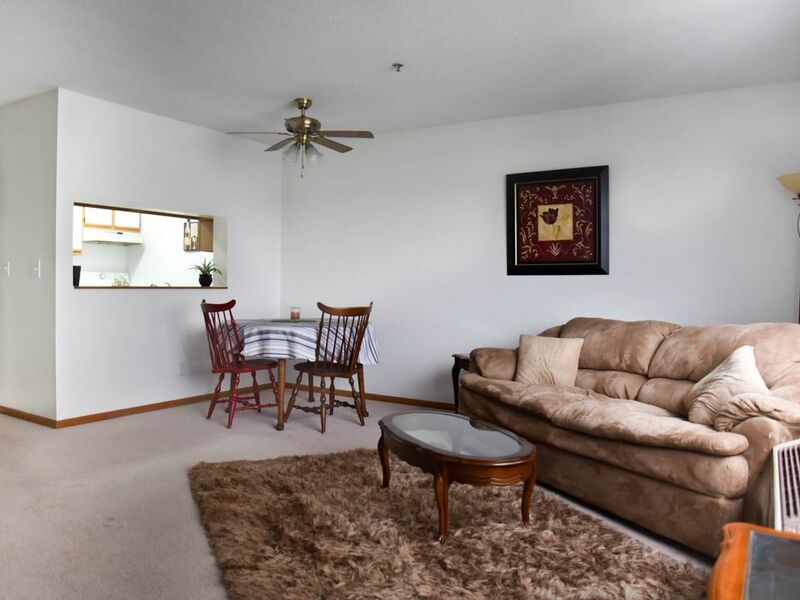 Also, the condo is conveniently located close to Interstate 380 if you need to get around Cedar Rapids. Being located in the heart of downtown Cedar Rapids you couldn't choose a better location for you stay. While staying for business or pleasure, you'll find that the location works to your advantage! Close to shopping, dining, night life, entertainment, local business and more. =Better Than Hotel! Also, we have another affordable condo in this complex, so if your need is more than 4, please let us know. Downtown lodging at a reasonable price. Being connected to the Cedar Rapids sky walk system allows for easy travel down town! A fitness center is yours to utilize during your stay, so you don't have to worry about missing out on your regular exercise routine. Also, a roof top deck adds to the uniqueness of this condo! bright and spacious bathroom with a great shower head. From outdoor patio on building. Yes. PTAC in living room and bedroom. Shared Laundry on Site. Just down the hall. Please inquire about Parking Garage parking. Recliner, Couch WITH PULL OUT BED, TV, Desk! Smart TV with cable and internet access. Amazon Fire stick. small speaker for your phone. Good sound. Close to everything Cedar Rapids! This was a very clean and great apartment to rent for the weekend. As advertised it is a budget stay so don't expect high end furnishings. Some pieces might need some general repair and replacement in due time. But over all I was very satisfied with the apartment. It was also easy to find and navigate. I also loved the skywalk access and how close it was to downtown. You can walk to alot of awesome places from this apartment including downtown, the Riverwalk and NewBo Market. Great location for a vacation rental! Enjoyed our stay. Great Ideal Location. I Would Stay Again! This place was perfect for me as it allowed to leave my car parked in a garage and not worry about parking meters or moving my vehicle around. My work was downtown at night so this was important for me. It was easy to get to and had many amenities if I needed them. I especially liked the skywalk connection to parking garages and the library. If I had a question or was unsure about something, I would get a prompt response for the owner. Thank you for a good stay. I would stay here again if available when I visit. This condo was just what we needed! Affordable and located right in the downtown area, within walking distance to many restaurants and parks. The parking structure was a nice perk too! This is a basic and inexpensive apartment with the primary asset of being within a few blocks of downtown, the convention center (Cellular Center), Paramount Theater, Veterans Memorial Bldg (only Grant Wood stained glass window in existence), and the Cedar Rapids Art Museum. The apartment was clean. The furnishings are simple, even a bit sparse (only 2 dining chairs, no place to sit down in the bedroom other than the bed). The bed mattress is very soft. The WiFi worked well. The owner was immediately responsive to a request for more towels and went above and beyond with a special request we had prior to renting (I wlil not specify so as not to obligate the owner to do the same for others). Communications were rapid and informative. A few suggestions for improvement: provide info on what and how to recycle, get a shade or other covering for the bedroom window as the vertical blinds do not keep out the all night outdoor lighting, put a light in the large but dark bedroom closet, consider a new couch in the living room. Bottomline - this served our needs very well while we attending a convention at the Cellular Center and was significantly less expensive than a hotel. Thank you for your review and feedback. The locations of trash and recycle are noted upon traveler check-in. There are now dark curtains in the bedroom to block the light. Also, there is a new pull out sofa couch with a new mattress and the lighting has been enhanced. I apologize your expectations were not met. This condo is noted as "Affordable". The complex is in the heart of downtown and is NOT a low income housing property. After dark, you have many amazing downtown amenities right next to you, enjoy! Parking is easy, as it is explained with pictures on the hospitality section of VRBO and in writing (with image) with the key card. Parking is also next to the complex in a ramp with a skywalk taking you directly to the condo (you don't have to go outside). In addition, there are many parking spots available on the street near the complex if you have more than one vehicle. Also, the furniture is very suitable for the condo and ALL of the other guests have rated their stay a 5 Star. All of the previous travelers enjoyed the VALUE they received by staying here. I recommended that you communicate your issues with owners during your stay versus letting them know after your stay. As with all of my other travelers, I want them to have an amazing stay and will do everything in my power to make sure of this. If you would have contacted me about your reasonable concerns, I would have remedied them immediately. Again, sorry you didn't enjoy your stay. I hope your communication improves with other property owners.